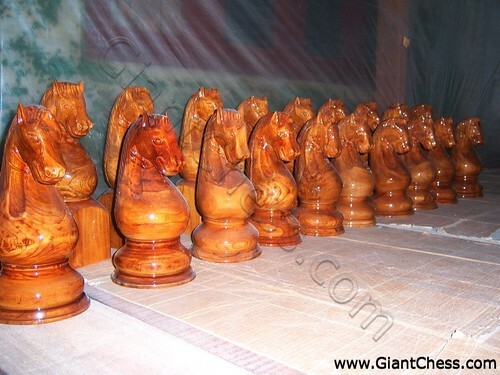 Besides providing Chess pieces, Chessboards, and Chess tables, GiantChess.com also produces Chess Trophies in various forms and designs. Since one of the most popular trophies given out at Chess tournaments is in the form of the Chess King, GiantChess.com. can provide either our 8" or 12" King Trophy (or Queen Trophy if desired) to be used for tournament prizes that will be cherished by successful competitors in all divisions, beautifully sculpted from prized teak by artisans who are also capable of creating unique bas-reliefs. To attract all chess players in chess tournament, we try to create unusual and unique trophy that in Knight form. Look at the picture above! You can feel the trophies are so unique and different that another chess trophies. The trophies has made of best quality of Teak wood and polished in brown or natural wood paint. Chess tournament will more interesting if you give this kind of trophy as reward.